The Abu Dhabi GP is always a highlight for photographes, because the race begins in the evening and ends in the night. So you can see some great lightning effects and have some great pictures of it. Otherwise are the races on the Yas Marina Circuit totally boring. The tracklayout is crap and with to many chicanes. This track has 5km (not really) run off areas so you can spin seven times and can be still third overall (happend to De La Rosa in Bahrain 2006). Or as Raikkönnen said in 2009: The first two corners are good, the rest of the track is s**t. The Abu Dhabi GP is this weekend. (2009 & 2010) and Lewis Hamilton (2011). dium for the energydrink. Hamilton was starting on pole and lead the race for 35 laps until he had a brake failure. Kamui Kobayashi was making fantastic moves on Raikkönnen and Sutil and it was the last race from BMW and Toyota. The fastest lap cam from Mr. Vettel. The most exicitng Abu Dhabi GP ever. 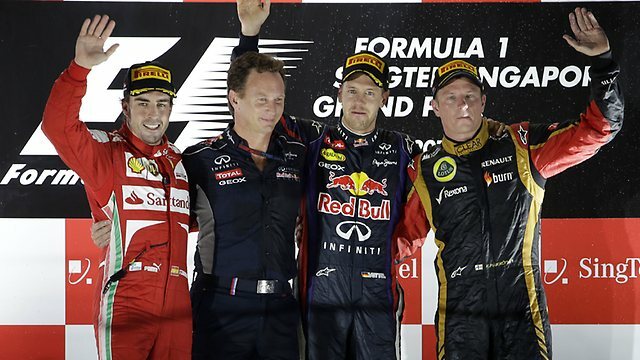 Alonso, Vettel, Webber and Hamilton had chances to become Formula 1 world champion 2010. Vettel was starting on pole and just had to win the race. Alonso had to be fifth to become the new champion, Webber was second in the drivers table, but after a terrible Qualifying (P5) the chance to get the first australian champion since Alan Jones 1980 was gone. All drivers had to retire and Hamilton had to win the race if he want it to be champion, unrealistic. Alonso had a good Qualifying session (P3), he just had to keep this position in the race. But Ferrari had to destroy every chance of winning the champioship with a bad pit stop strategy. Alonso left the pits behind Petrov on P7, who drove the best race of his career. Vettel was leading from start to finish. Vettel was coming trough the finish line and then Christian Horner said: Wait Vettel, it’s not over yet (remember Brasil 2008, Massa vs. Hamilton?). After all cars from P4-P6 came ahead of Alonso, Vettel won his first champioship and won the Abu Dhabi GP for the second time in a row. Hamilton second and Button third. Schumacher had a scary collision with Liuzzi at the start of the race and had to retire, a bad end of his first season since his retirement in 2006. Hamilton drove the fastest lap. It looked like another win for Vettel, but everything was coming diffrent. At the start everything was normal, Vettel driving ahead into Turn 1 but then in Turn 2 came the surprise. The air of the left rear tire has gone away, so Vettel spun out and had to retire at the end of the first lap. Hamilton was leading the race and won it at the end, Alonso behind and third was Button. Webber was driving the fastest lap.